REDWOOD CITY, CA (October 18, 2017) — Annual compensation for boards of directors at the largest U.S. public companies has risen nearly 20% over the past five years, according to a new report from Equilar, Director Pay Trends, which features independent commentary from Meridian Compensation Partners. In fiscal year 2016, the median annual retainer—or base pay in cash and equity—was $245,000 for directors at Equilar 500* companies, up 19.5% from $205,000 in 2012. Director pay overall has increased consistently on a year-over-year basis, with modest increases anywhere from 2% to 5% annually. 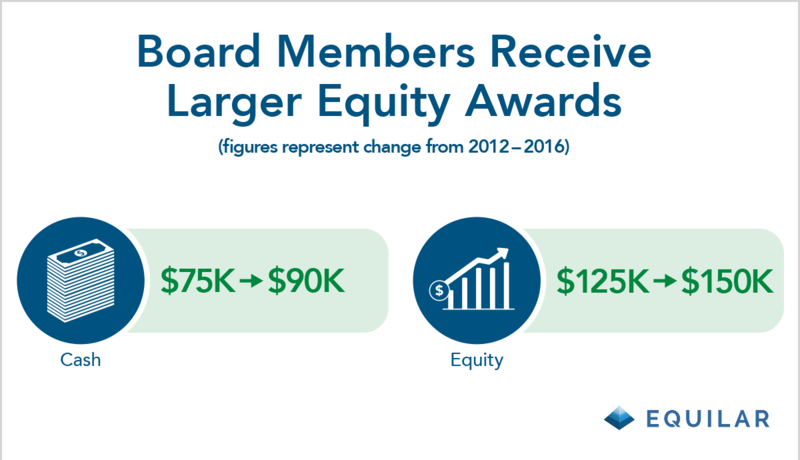 It’s important to note that because director pay is now more commonly being awarded in equity grants, values are increasing, but that’s not necessarily money board members are putting directly in their pockets at the end of the year. Among the companies that awarded equity to their directors, median value was $150,000 in 2016, up from $125,000 in 2012. Cash awards—which are provided at 98% of companies—increased in value from $75,000 to $90,000 at the median, according to the report. Though executive compensation has been a more popular topic of interest and scrutiny over the last few years, some elements of director pay, such as meeting fees, have declined and are falling out of favor. In the 2016 fiscal year, just 14.5% of companies awarded meeting fees to directors, down 15 percentage points from 29.5% in 2012. The largest decrease in companies granting meeting fees occurred between 2013 and 2014, and then again between 2014 and 2015, with both years dropping 4.2 percentage points from the previous year. According to Rosenthal, these trends reflect a number of considerations, including the view that meeting attendance is a basic duty requiring no additional compensation. However, some boards want to recognize the additional responsibilities and time commitment associated with committee service and thus the prevalence of committee member retainers has increased in recent years. These retainers, while modest in value, serve to recognize the additional duties for, and additional contributions by, directors that serve on board committees. “The elimination of meeting fees also enhances the transparency of the director compensation program, as shareholders can more easily understand the annual compensation that will be paid to directors,” Rosenthal said. * The Equilar 500 tracks the 500 largest, by reported revenue, U.S.-headquartered companies trading on one of the major U.S. stock exchanges (NYSE, Nasdaq or NYSE MKT (formerly AMEX)), adjusted to approximate the industry sector mix of similar large-cap indices.